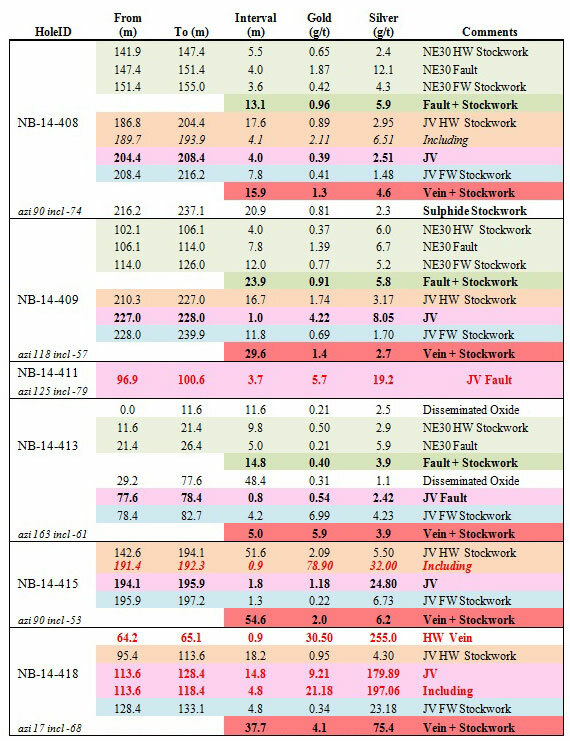 Vancouver, B.C… Corvus Gold Inc. (“Corvus” or the “Company”) - (TSX: KOR, OTCQX: CORVF) announces the latest results from its 2014 drilling program at the North Bullfrog Project in Nevada (Table 1, Figure 1). The 2014 drill program successfully extended the Yellowjacket deposit to the north and at depth as well as expanding the new high-grade, Gap Shoot Zone to 350 metres along strike. In addition new detailed Yellowjacket information is being integrated into a new and aggressive, District wide, exploration drill program for 2015 to further delineate high grade gold mineralization and identify new deposits in highly prospective areas of the property. Hole NB-14-418, a broad high-grade intercept (37.7 metres of 4.1 g/t gold and 75.4 g/t silver) with significant silver that extends the previously discovered Gap Shoot Zone to the north. Hole NB-14-415 (54.6 metres with 2 g/t gold and 6.2 g/t silver) tested the zone about 200 metres down dip from the surface. 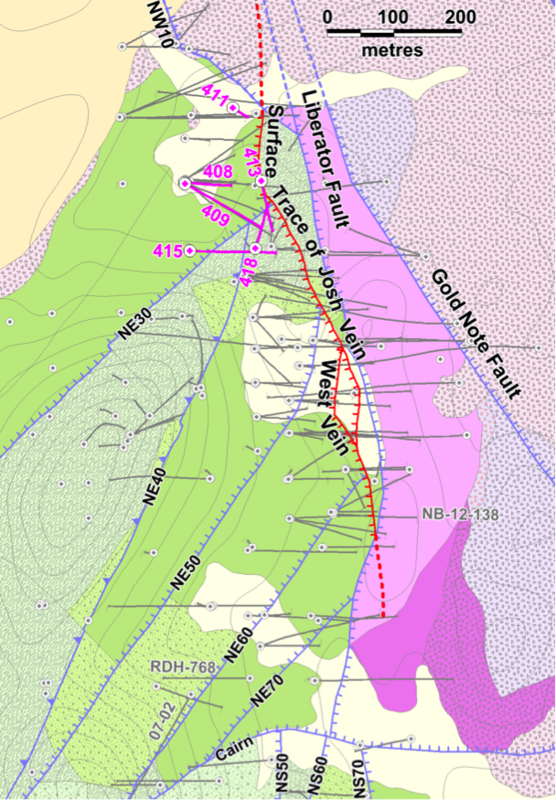 Hole NB-14-411 (3.7 metres with 5.7 g/t gold and 19.2 g/t silver) extends the known mineralization of the Josh Vein system 50 metres north and 50 metres up dip from any previous drilling to date. Holes NB-14-408 (15.9 metres with 1.3 g/t gold and 4.6 g/t silver) and NB-14-409 (29.6 metres with 1.4 g/t gold and 2.7 g/t silver) tested the main Yellowjacket system approximately 225 metres down dip from the surface confirming its open at depth. The drill results reported here have extended both the up dip and down dip continuation of the Yellowjacket deposit as well as potentially enhancing the overall grade. With NB-14-418 drilling in the Gap Shoot Zone which was originally discovered in hole NB-14-399 to 401 near the intersection of the main Josh Vein and NE50 fault zone (NR14-22, reported on October 28, 2014) NB-14-400, 35.9 m @ 17.1 g/t gold and 19.5 g/t silver) has now been drilled on 50 metre spacing over a strike length of 350 metres in which every hole has had grade thickness intercepts in excess of 100 gram metres (equivalent to or better than 10 metres of 10 g/t gold). This has now defined a large area of very high-grade mineralization that would be an immediate target for open pit mining of the Yellowjacket deposit. In holes NB-14-411 and NB-14-413 the up-dip extension of the Josh Vein main structure is filled with fault breccia and crushed vein material rather than forming a classic vein but the grade and widths are above average for the high-grade zone (Figure 1). This change in style may explain, at least in part, why the vein structure is blind at the surface. Holes NB-14-408, 409 and 415 all tested the structure 50 metres down dip from any previous drilling on these sections (Figure 1). All of these holes encountered substantial widths of higher grade mineralization indicating the system is potentially open at depth for further expansion. In addition holes NB-14-408, 409 and 413 also tested the mineralization along the NE30 fault zone (Figure 1). This structure is emerging as a new well mineralized vein system. These early shallow intercepts in the NE30 system are characteristic of upper lever mineralization that was first encountered in the Yellowjacket system and has outlined significant high-grade discovery potential at depth. Final geological modeling of the Yellowjacket Zone is currently underway and it is anticipated that a new resource will be calculated in the first quarter of 2015. This resource will form the basis of an initial Preliminary Economic Assessment (PEA) that will incorporate the Yellowjacket Deposit. The PEA is scheduled to be completed in Q2 of 2015. In addition, Corvus is engaged in detailed metallurgical studies of the new high-grade mineralization which have provided very encouraging initial results. The North Bullfrog project is also being advanced on a number of development fronts as well as project characterization work ahead of permitting. Figure 1: Location of Phase II drill holes at Yellowjacket. Assays from the holes indicated in fuchsia are reported in Table 1. Holes are labeled with last 3 digits of name.